Wanna know what’s the most fun experience to have in Valencia? It’s Las Fallas, an important festival that happens every spring. Las Fallas is an entire month of minimal sleep, fireworks, fiestas, amazing giant puppets, incredible bonfires, and lots of food, of course. Sound like your type of party? Then here’s the ABC to help you navigate this important Valencian festival like a local. Las Fallas is newly minted in the UNESCO listing of ‘Intangible Cultural Heritage of Humanity,’ and if those big guns think it’s cool, why wouldn’t you, too? Las Fallas celebrates the arrival of spring and is a religious holiday during which Valencians commemorate Saint José (the patron saint of carpentry) on March 19. Even though the key week of celebrations happens from March 15 to 19, Valencians know how to turn up the dial on their fiestas by extending the fun into a month-long celebration. More fireworks, more gunpowder, more noise… everyday! Las Fallas is an event not for the faint of heart, as everywhere you go this month, young and old will be playing with firecrackers and “pop-pops” in the streets. From the first of March until the 19th, daily fireworks displays (known as ‘La Mascletà’) are fired off at 2pm at the Town Hall Square (Plaza del Ayuntamiento). 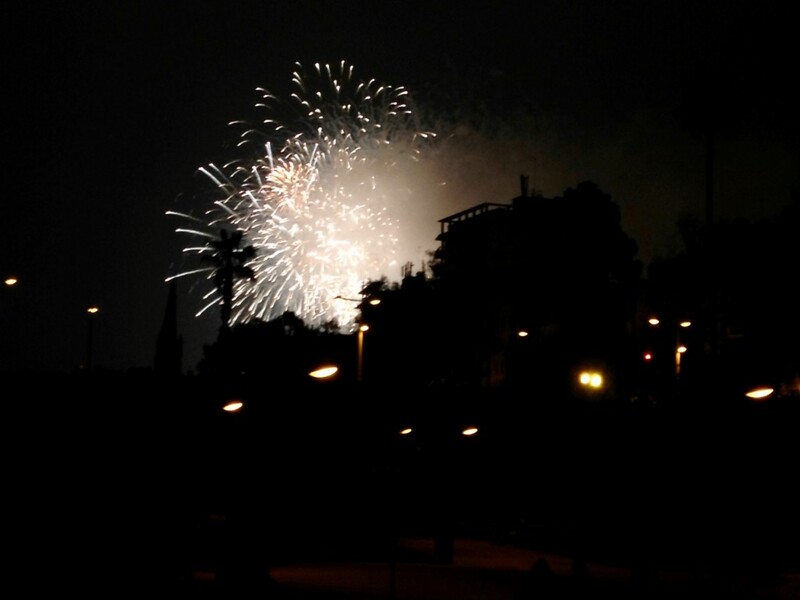 Nightly on March 15-17, there will also be fireworks down by the old riverbanks-turned-Turía Gardens. If you can’t keep up, just make sure you don’t miss ‘La Nit del Foc’ on the festive night of March 18 for the grand finale fireworks spectacular! For best views, we recommend heading as close as you can to the bridges of Pont de les Flors and Pont de I’Exposició. One of our favourites at Las Fallas are the unveiling of these towering cartoon-like installations (also called fallas) with their accompanying puppets (called ninots) that dot every barrio in Valencia. Satirical, comical, political, or even romantic, you can expect differently themed installations every year. Each neighbourhood association will commission two of these firecracker-filled papier-mâché and wood creations to be built every year to represent them (a giant one for the adults, small for the kiddies). These creations don’t last long as they get burnt to a crisp on the last festive night except one — but more on that later. #localsknow La Plantà happens on March 15 when all the fallas installations have to be completed by the end of day in order to qualify for the big Las Fallas judging contest. That’s when we recommend you put on those comfortable sneakers, have your camera charged up, and start exploring our city to hunt for these stupendous creations. To see some of the more elaborate ones, we recommend you visit the barrios of Ruzafa, El Carmen, and Plaza del Ayuntamiento. Nothing says party like a street food fiesta, and the fun continues with street food fairs in abundance. 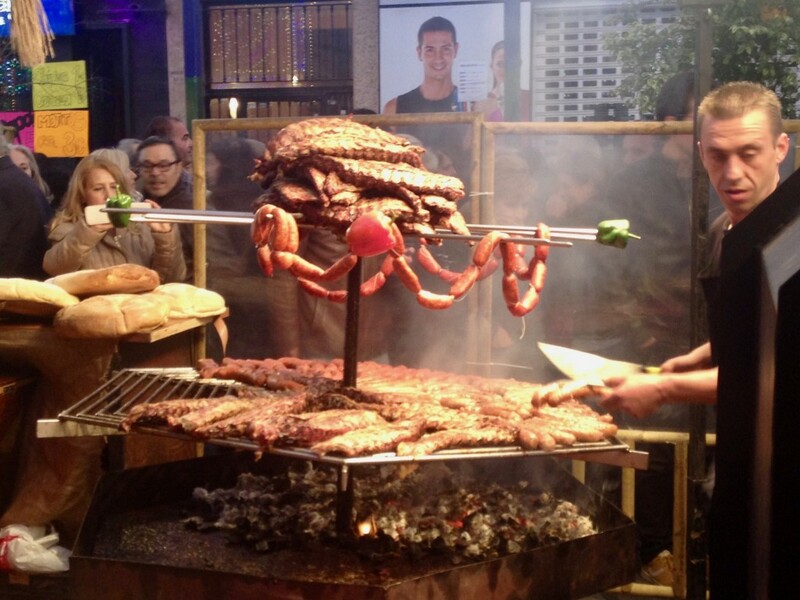 No dainty tastings here, but tapas, giant paellas, delectable jamón, stacks of mouth-watering sausages and ribs, or even seafood on the biggest grills you’ll ever see. The aroma of chargrilled goodness can usually be smelled from even far away. 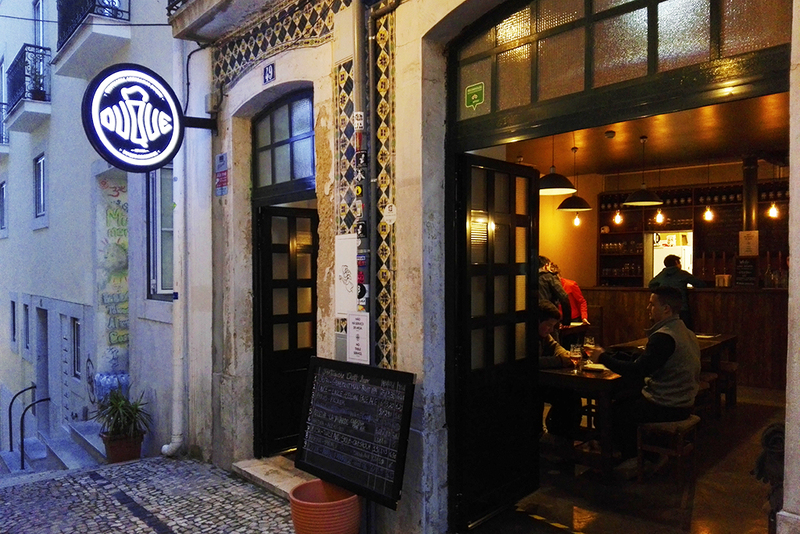 So grab a cerveza, flash our friendly street vendors a smile and an “Hola!”, and order away like a local. For those with a sweet tooth, follow the fried foods scent and you’ll find many of these street corner mobile kiosks selling goodies such as the popular Spanish churros and buñuelos, a Valencian sweet treat mostly enjoyed during Las Fallas. Buñuelos are golden-brown fried pumpkin fritters served with a heavy sprinkle of sugar on top. Or go for the gold and enjoy them with a cuppa thick hot chocolate for dipping. Why not? You’re on a holiday diet after all! You can also find them at one of our favourite local cafés, Horchatería El Collado. Fancy a light show extravaganza? Come around to the barrio of Ruzafa and hang around the streets of Calle Sueca and Puerto Rico, and you’ll probably find the street food fair and an elaborate light show just like this one that stretches for kilometres (coordinated with music, too). There are plenty of dining and bar options around here, such as Pepe’s, where #localsknow Alberto’s mojitos will keep you jolly the whole night. Marvel at these traditional Valencian regional costumes worn by the falleras (female) and falleros (male) during special occasions such as this. Some of these intricately hand-sewn silk and lace costumes are known to cost thousands of euros. 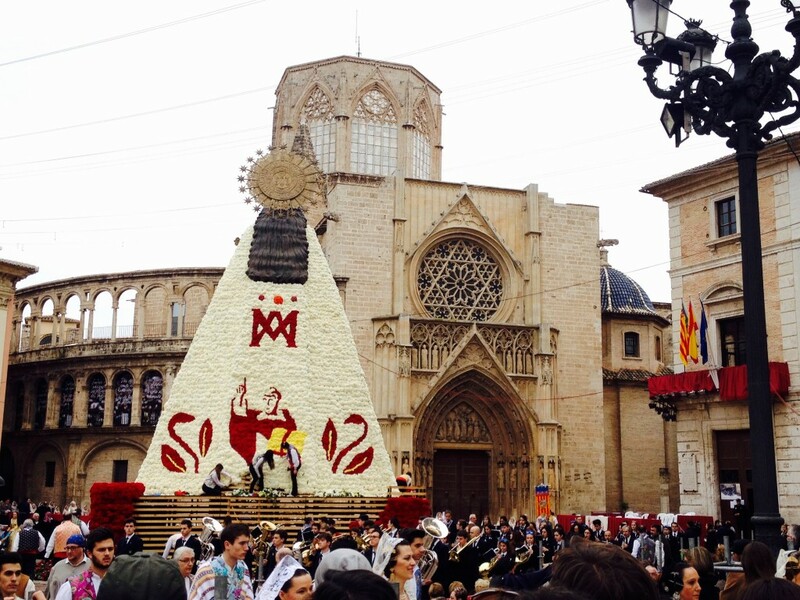 Get to Plaza de la Virgen early on March 17 and 18 for a prime spot to witness the colourful processions and L’Ofrena de flors, when falleros and falleras make flower offerings to the Virgin Mary. Watch the flowers being tossed up to skilled little helpers who will insert them into the 14-metre-high Virgin Mary wooden statue. It’s an eye-catching sight you don’t want to miss. “Burn baby burn…Disco inferno….” Just the right tune was streaming from the headphones of the amigo next to me as we watched the fallas puppets go up in flames at last year’s ‘La Cremà’ — the burning that happens on the final night (March 19). All of the neighbourhood creations will typically be burnt on-site close to midnight, while the grand finale happens an hour later at Plaza del Ayuntamiento, where the city’s main falla is burned last. Why the build and burn? Legend has it that it mirrors the Pagan tradition in which people would stack their old unwanted belongings out in the streets to burn away their excess from winter to welcome spring. It was believed a carpenter hung a lamp on top of a pole and over time even decorated it with clothing. Over generations this evolved into these elaborate installations that we get to enjoy today. 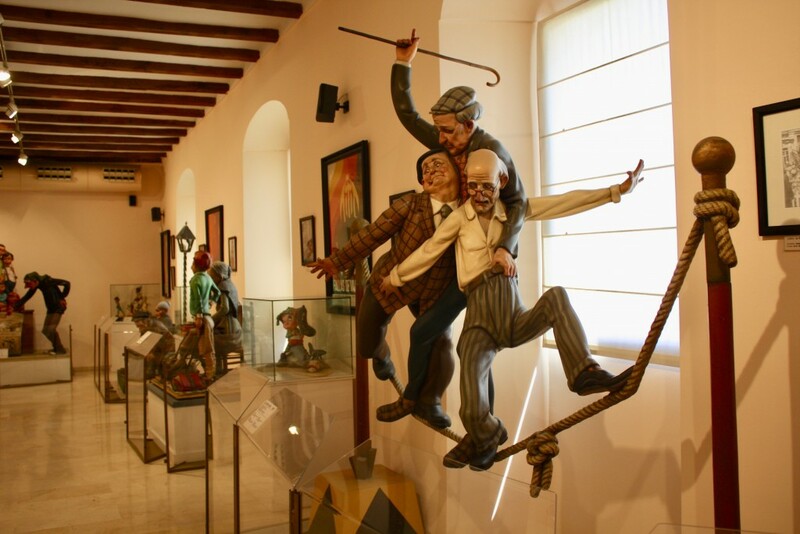 If you want to experience more, you can relieve it all at Museo Fallero, which houses the winning ninot that’s spared from the yearly La Cremà burning. You’ll find an interesting display dating from the 1940s to today, and countless photos and history for you to learn all about this festival that is the pride of Valencia. Want a sneak peek of what to expect at Las Fallas 2018? Here are a few of the highlights from the last festivities with Valencia Urban Adventures! Gracias C.G.! Hope you can join us for Fallas soon! So what’s the best way to go from Barcelona? Any ideas or tips? I’m planning to visit Valencia next year in March. Luckly i´ve discovered Fallas, I never heard about it. I just have one question. The festival begins at 15 march? Is there anything in the streets before it (excluding fireworks)? Hola Nuno, thanks for reading our blog, hope you enjoyed it. The main week of Las Fallas is from March 15 – 19. Before that week, there are a few things happening to build up the excitement to this biggest celebration. From first week of March (until March 14/15) at our Science Museum by the City of Arts & Sciences district, there will be a huge Ninots exhibition letting you preview what this year’s big Fallas installations are going to be in the streets. You can see 1 ‘puppet’ (ninot) from each new installation at this exhibition (over 700 of them) & you even get to vote for the winning ninot that will be kept in the Fallas Museum (as written in the blog). Typically by that first two weeks too, you can find some street stalls already set up to sell sweet treats as such the pumpkin fritters. There is the daily Mascletà (huge firecrackers show lasting for about 5-8mins) that happens at 2pm at Plaza del Ayuntamiento (this starts from the last week of February until March 19th). In past years, even from the 2nd weekend of March, lightshow extravaganzas in the Ruzafa neighbourhood would have started nightly. More importantly, you can start to see big fallas installations being slowly constructed in the streets in the week leading up in the 15th-16th because that’s the dates they have to be completed and judged for this festival. Our city certainly has a party atmosphere even before the main week. My best advice for you is to book now for accommodation and flights should you like to join us for las fallas (even if you plan to arrive before the main week). We hope to see you in Valencia next March, and perhaps take you on one of our tours! Hope this helps. Good question! But sometimes the “strange” events are the fun ones, don’t you think? For us in Valencia, the word Unusual is probably how we would describe Las Fallas, this biggest & most important celebrations in Valencia. Maybe you find it strange on why we celebrate by burning away these hundreds of amazingly built papier-maché sculptures and why we love the daily firecracker shows? Well, in a nutshell, Las Fallas celebrates Patron Saint of Carpenters, Saint Joseph and that’s on the festival’s last day, 19 September. Some historians will tell you centuries ago, local carpenters would gather their unwanted belongings in the streets in a pile to burn them, like burning away your excess from winter to welcome the spring equinox. Among the things would be the wooden poles & their hanging oil lamps that the carpenters no longer need as the days get longer & warmer. As centuries go by, throw in a bit of creativity and fun tradition, with someone starting to dress these wooden structures like a person, adding clothes & things…and that’s how a celebration was born out of the burning of these crazy sculptures! 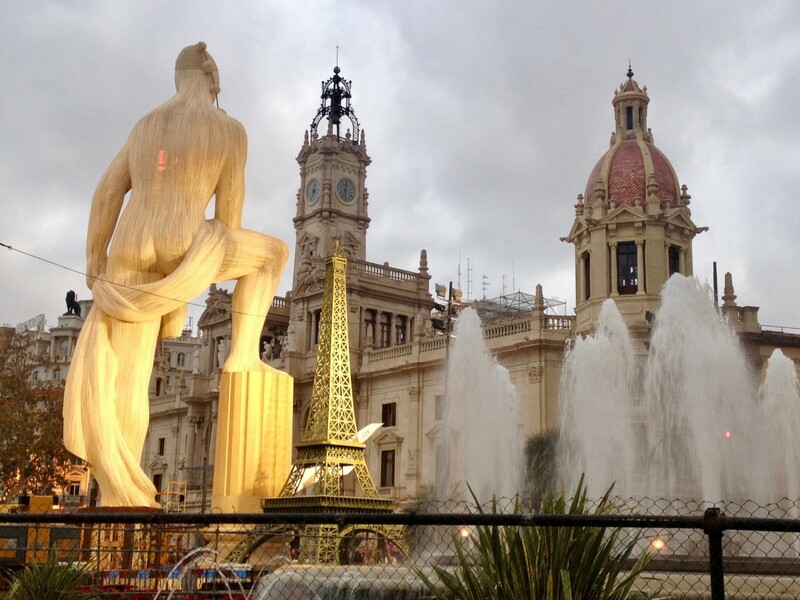 To Valencians, Las Fallas is all about these incredible towering sculptures, exciting smell of gun powder, heart-thumping noise from firecracker & fireworks, music, paellas with our friends, a party atmosphere & street food everywhere, how can that not be fun?! We certainly think it’s a once-in-a-time experience for our visitors & we hope you can join us one day. Let us show you around! What are the best hotel to stay in during Las Fallas? Hola Ron, we are glad you are considering a trip to join us for the Las Fallas festivities. Las Fallas is considered the biggest & most important festival in our city, so the busiest, possibly most expensive (but exciting & well worth it!) time to visit Valencia. Therefore the short answer is whichever hotel you can still secure now at your budget & taste, especially those within Valencia Old Town if you want to be in the center of action (many even book their accomodation 6mths-1yr in advance). Besides hotels, you can also consider holiday rentals and Bed & Breakfasts too from reputable online booking websites. – If you want to be in the thick of all the festivities, consider Old Town/City Center area (eg. La Seu/ El Carmen/close to Mercado Central, Plaza del Ayuntamiento or North Train Station). – If you prefer to be a bit further from all that noise & chaotic atmosphere, then consider areas like En Corts/ Montolivet (where the City of Arts & Sciences is) or even our city beaches areas (eg. Cabanyal/ Playa de la Malvarossa). Convenient public buses & metros, taxis or short bicycle rides will get you into the CC from here. Hope these help & hope to have you tour with us during your visit! Can you advise me how and where we can get to the festival from Xeraco?? We have a car but after reading many articles I’m afraid to drive all the way into Valencia between March 15-19. Will there be extra metros available during the evening of the 19-20th? My plan is to drive to a train station, park the car and travel into the city by train (or Metro). We are arriving from Canada the week before so will not know the area that well. Will it be possible that the trains will run late on the 19th, say after the fireworks?? Any help would be appreciated!!! Hopefully we can make this happen! How exciting that you’ll be joining us for Fallas this year! Here are some general advice. Usually around the main fallas week from 15 March, there will be many road closures due to the hundreds of Fallas monuments dotted in our streets. So I agree with you that driving into Valencia city and trying to find appropriate parking will most likely be tricky. So your best option is public transport. In past years, the metro and Renfe trains do operate at more frequency and later operating hours to accommodate the Fallas crowds. They haven’t publicly announced the schedules for this year, but we can assume they may offer similar, so it’s best you keep your eye on their online schedules closer to the time. To start, Google maps is a great tool & very useful and accurate for our city. If you map yourself from Xeraco to Valencia Nord, you’ll see that you can take a regional Renfe Train from Xeraco into Valencia Nord (Valencia City). This is the stop to Valencia City’s Main Train Station Estacion Nord. This will get you to our city centre and the center of action for Fallas festivities (a tip: the main Fallas at our City Hall-Plaza del Ayuntamiento will be spectacular!). Great option to consider. Hope the above helps and if you have any touring needs, we’ll love to be your guide and show you around! Hi guys, thanks for the great article. I am personally a big fan of Las Fallas myself though I’ve visited it only one time (and it was 8 years ago). But yaaay luckily I am going back this year. Can’t wait. I am a travel journalist and after my last time in Valencia I’ve written an article on fallas but I think a lot have changed since then (sadly no Nou Campanar falla as I’ve read). Could you please tell me is there a map of all the fallas already available online? I can’t find it anywhere just a few hints but not the official map from tourist office. Also I wanted to ask you whether Las Fallas has changed a lot. For example to enter the Nice Carnival now you have to pass all the security guards with opening the bags, throwing out water etc. We all understand the reasons but still – is it the same now in Valencia? And if not how’s the security there? Thank you for the great article one more time and see you at Las Fallas! Hola Anastasia, thanks for your comments. We are glad to know you are familiar with the awesome craziness that comes with this most important festival on our Valencian calendar! We can’t wait for this main week to start on the 15th! You may be aware, there are over 700 big Fallas (the monuments we build in the streets) & similar number of miniature ones (for the kids), so we can imagine it being a mammoth task for anyone to keep track of them all location wise! So besides this link below of an Official Map that our local Tourism Office has issued, we do not know of a listing available of all the Fallas. From this map, you can at least find the locations to the group of most important (& usually most impressive) fallas that will be in our streets. We think this is a great start and usually what most locals & visitors lean on. As for security, our local officials and police usually does a great job in putting in extra police presence (and crowd control barricades) in our streets for big festivals such as Las Fallas, to ensure locals and visitors alike enjoy our festivities in the best way possible, and so far, it hasn’t hindered our enjoyment. We don’t know of any announced additional measures until closer to the main week (or when you are there). So if you are enquiring for work purposes too, perhaps you can send an email or contact our Official Tourism Office in the website above to ask them for special press permissions for you to have more “behind the scenes” access, so to speak. We hope you enjoy the experience again this year for Las Fallas!